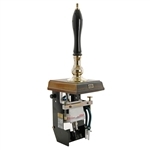 The Angram Model CQ (pictured left) combines supremely elegant styling with the faultless operation and long-term reliability which have made Angram famous for handpump beer dispensers of the highest quality. As a recent addition to our long established range of handpumps, the Model CQ provides a wide range of options and benefits from the same light and precise action which make all Angram handpumps a delight to use. A SCHEMATIC drawing with precise measurements is also available. The optional Water-Jacketed Cylinder Assembly keeps beer within the cylinder cool. The water jacket obviously needs to be hooked up to a supply of coolant such as cold water or glycol. If glycol is used, the pressure needs to be below 30 psi, otherwise the water jacket can be damaged. An alternative is to set up a water reservoir in your cask fridge and pump it around the cylinder. It makes sense to run it along the beer line to keep that cool as well. It is important that the pump you use is NOT a submersible as the action of the pump will generate heat in the water reservoir thus defeating the object. Occasionally a replacement part is required to keep the handpump working smoothly and efficiently. Here is an EXPLODED-VIEW DRAWING to help understand how all the parts come together and what might be required. A separate exploded-view drawing is available for the CYLINDER ASSEMBLY. A PARTS LISTING is shown separately with reference codes. Some parts are instock and can be ordered directly, while others need to be special-ordered. #23154 Angram CQ 1/4 pt. single pull - Reconditioned in the Angram factory. Tested to full standards of a new engine. #23160 Angram CQ 1/4 pt. single pull water jacketed cylinder - Reconditioned in the Angram factory. Tested to full standards of a new engine. #23165 Angram CQ 1/4 pt. twin pull - Reconditioned in the Angram factory. Tested to full standards of a new engine. #23167 Angram CQ 1/4 pt. twin pull - water jacketed cylinder - Reconditioned in the Angram factory. Tested to full standards of a new engine. #23170 Angram CQ 1/4 pt. triple pull - Reconditioned in the Angram factory. Tested to full standards of a new engine.